Blades produced by its own. Chisels of Chinkin-shi. The second part of ‘The idea of tools’ will introduce Wajima Lacquer. Those tools are used in the “decorative” category, such as Makie, Chinkin. I think that there are also many people who know because it is taken up also on this site, one of the significant features of Wajima Lacquer is its robust first coating. By repeating placement of Urushi and having it dried, the layers become robust and enough thick. Chinkin techniques have become developed based on such characteristics as mentioned. Left・Bottom Right： Chisels used to engrave circular patterns such as family crests, working in the principle of compass. Upper Right：Chisels for dot engraving. Mr. Yamazaki, Chinkin-shi, has started his apprentice by learning dot engraving. Upper Left：A variety of chisels selectively used according to the purpose. Bottom Left：Engraving patterns by using rounded chisel. Right：Mr. Yamazaki shows us his favorite grind stones. Grinded lines are clearly visible. 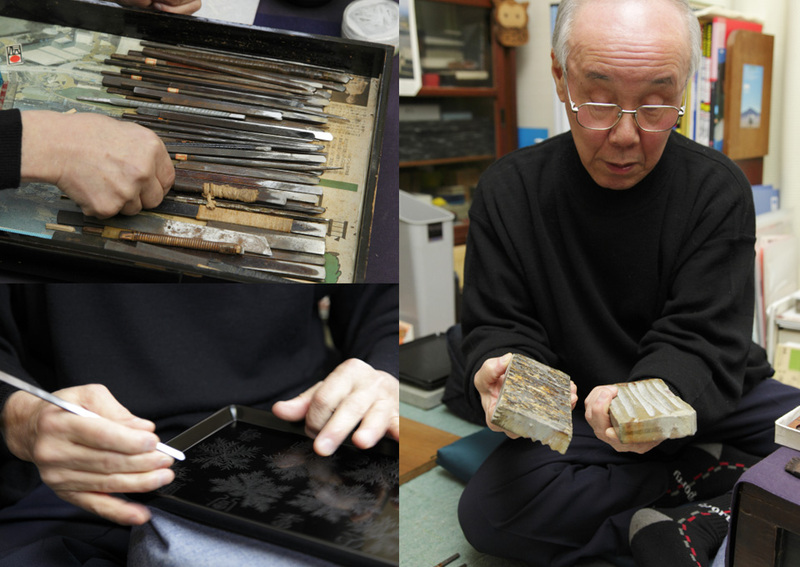 Upper Left：Placing Urushi on patterns engraved by chisels, putting gilt and making it sunk. 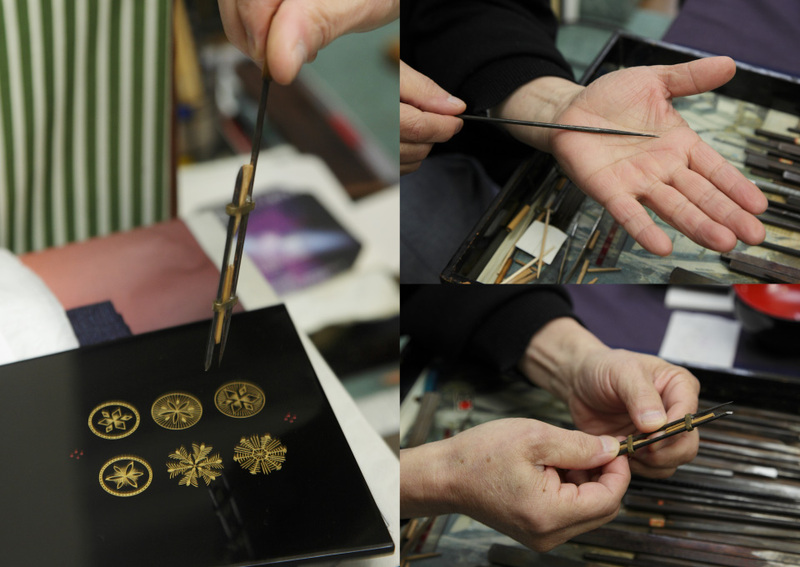 Bottom Left：As removing excess gilt using a piece of Japanese Paper, the beautiful patterns come up. Upper Right：Although it may be hard to see, the one under the elbow is the “pillow” of Mr. Yamazaki. Bottom Right：Holding that “pillow”, he performs his work in a stable position. It was tough even just to keep such position at the beginning, he said. As well as Chinkin, Makie is a well-known decorative work of Wajima Lacquer. 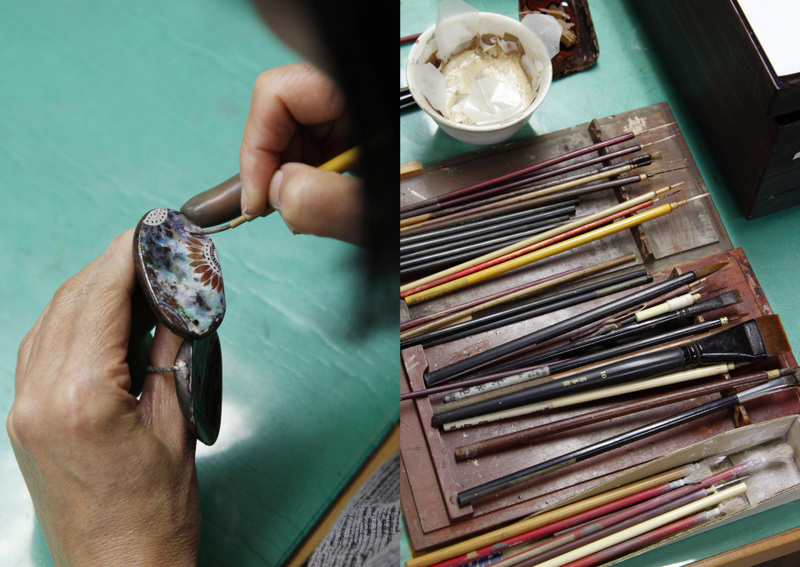 A wide range of tools and materials are used in order to draw variety of patterns in different colors on Urushi surface. 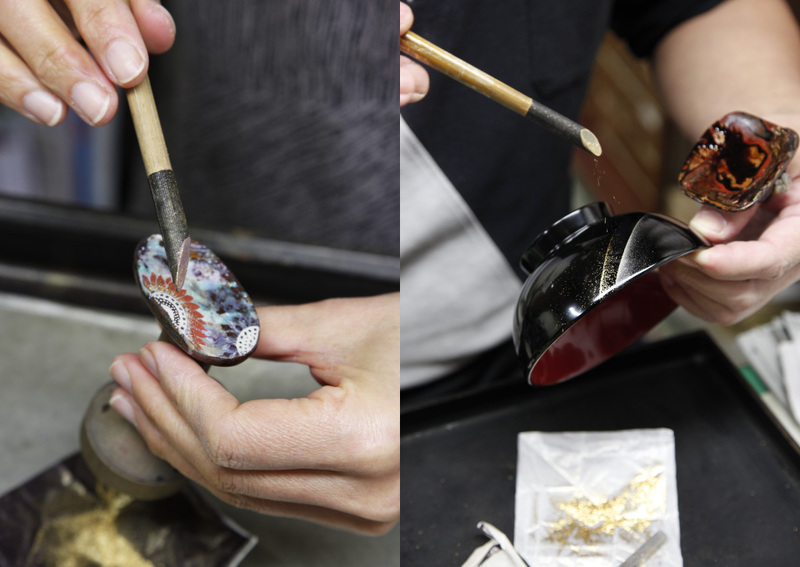 Left：Lacquering gold powders using powder tube on Urushi. Right：Patterns in various aspects are drawn by adjusting height of the tube. The tool put on the left thumb is a small palette called Tsumeban. The first one is powder tube, which is a tool used to perform “lacquering” powders of gold that is the origin of the word “Makie (Lacquer or Lacquerware)”. It is basically made with bamboo, but in different diameters or with several types of pieces of silk fabric attached on the sifting surface, in order to optimize amount of powders coming out. There are also slimmer ones made with rachises of cranes. Before lacquering work mentioned in above, a work must be done is to draw patterns by Urushi on the surface. 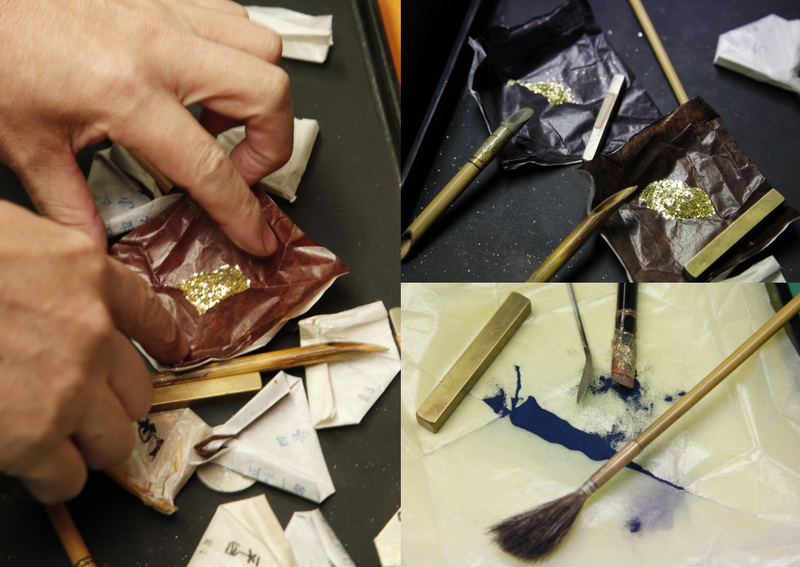 Makie is a process of having the surface lacquered with gold powders, making the patterns solidified, drying after placing transparent Urushi, and having it polished. 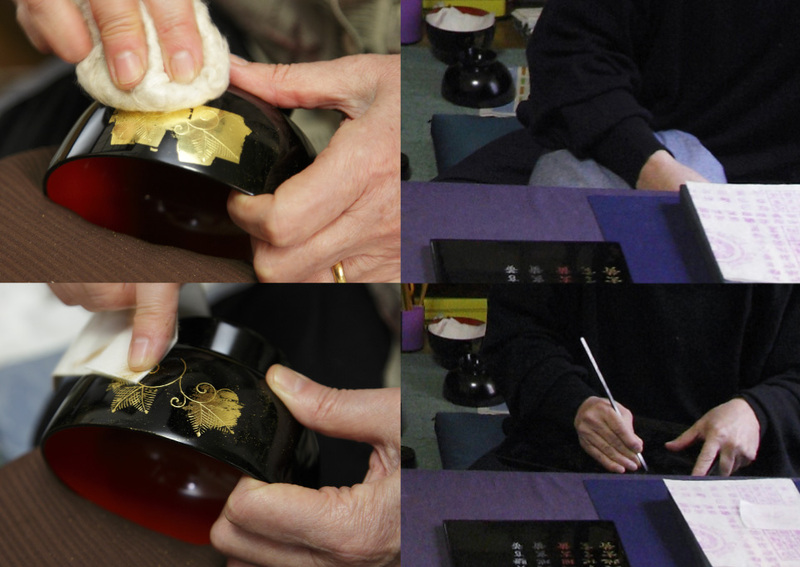 Left：Using a thin Makie brush, craftsman places Urushi, tracing the patterns. Brushes are made with pelage of animals such as mice. Right：Number of types of the brushes is uncountable, but in most cases every craftsman disassemble their brushes to make them trimmed into length. Pelage of variety of animals such as cats and mice used to be used as materials of pattern drawing brushes in the past. For brushes, in particular, to draw thin and precise lines, pelage that well takes Urushi in and smoothly runs it off is recognized preferable. Above all, the pelage of mice living in the grassland around Biwa Lake has been treated as the best choice because of its long absorptive hair however domestic procurement of such good pelage has become extremely difficult. As for lacquered powder materials there are gold, silver as well as bluish gold, and depending upon the shape of power, rounded, coarse metal flakes, pear-skin finish, and flat ones. Other than these, there is also Raden technique (taking inner surface layer of seashells and have them lacquered). Lacquering materials such as gold, silver and bluish gold powders are respectively wrapped in a piece of paper and carefully stored. The role of Roiro-shi is to further polish the surface of Urushi, which is already layered with first, middle, and finish coats, for finalization at the level of a mirror. To perform Chinkin and Makie, this Roiro is indispensable to perform as a preparative process in fact. Products with none of Roiro, Chinkin, or Makie done are of course fine also. To polish to make it like a mirror, quality charcoal (Suruga charcoal from Shizuoka) is to be used. And for final polishing, finer Roiro charcoal is used. Left：Polishing with Suruga charcoal comes first. The surface already becomes as smooth like you see your face in a mirror. Right：Mr. Ohashi, Roiro-shi, who explained us about types of charcoals. He cuts his charcoal into size for ease of use. 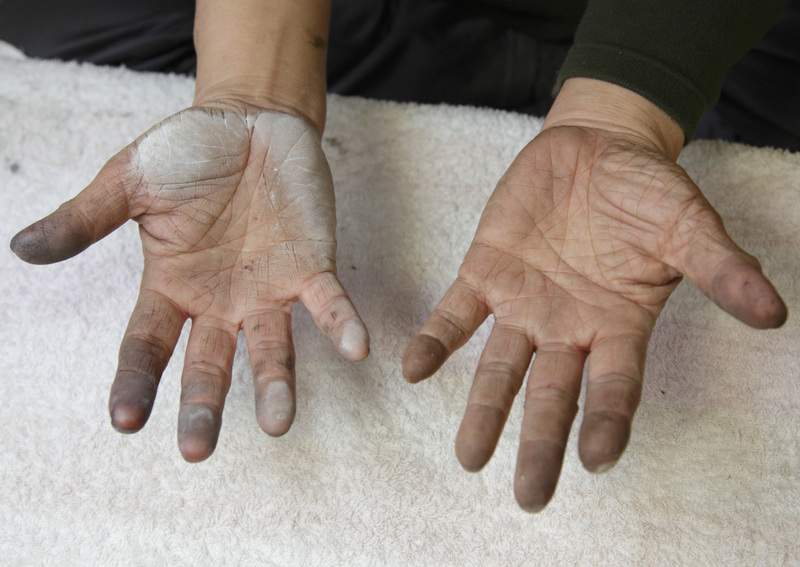 At the final stage, craftsmen use powders of oil stone and compounds, and the polish is performed directly by their hands. 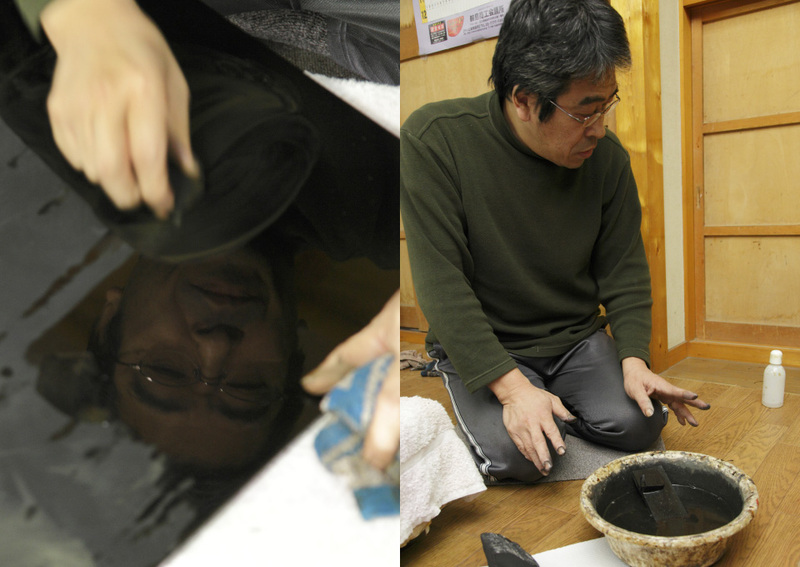 As skin oil and finger prints may give some influences, the “hands” of Roiro-shi performs polishing, at a ‘micron’ level, finer than those done by machines. The most excellent tool for this process is their hand. Roiro-shi uses the own hands as the ultimate tools. 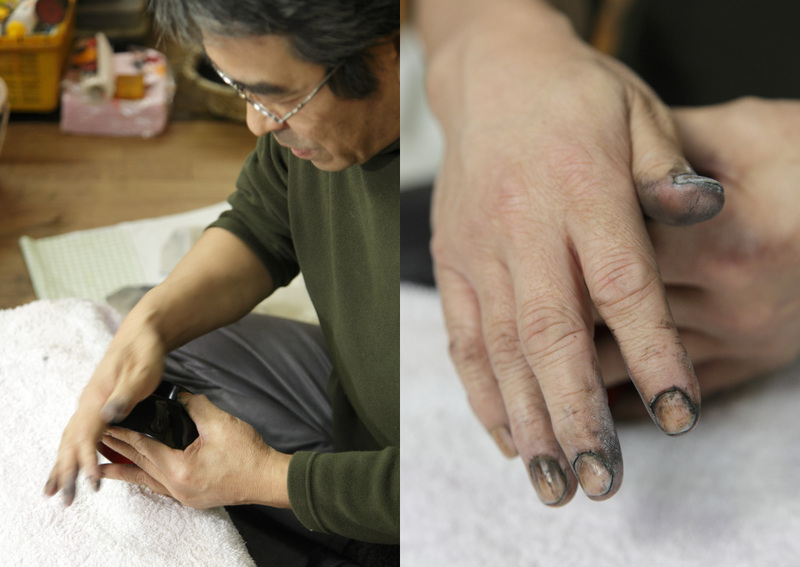 Roiro-shi performs the final polishing using its hands as the tool. Highly developed sense of human’s hands make the surface smooth at a level of ‘micron’. Hands of Mr. Ohashi. The ultimate tools of the Roiro-shi.